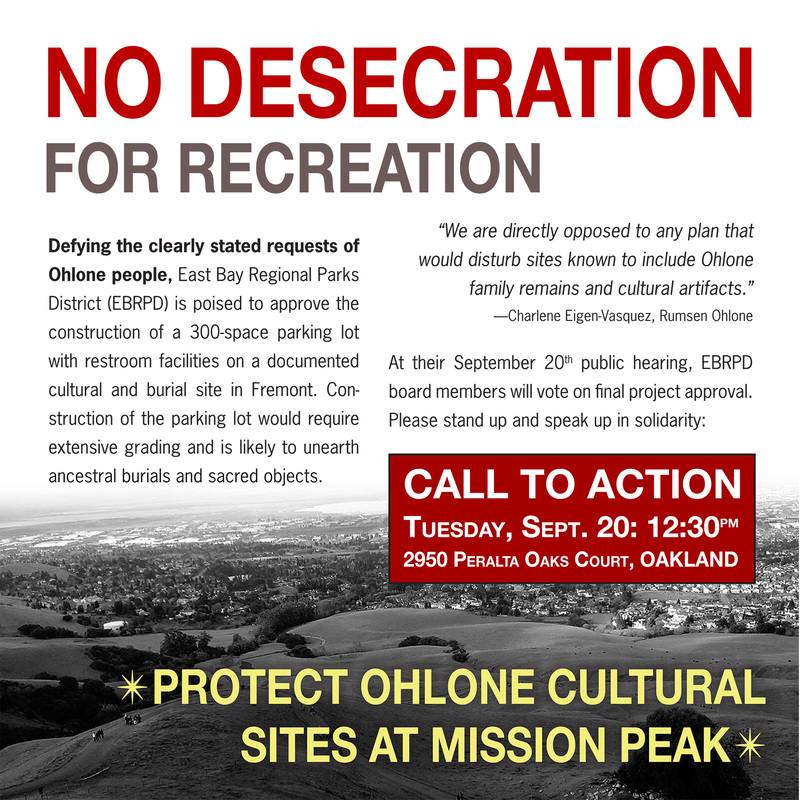 Defying the clearly stated requests of Ohlone people, East Bay Regional Parks District (EBRPD) is poised to approve the construction of a 300-space parking lot with restroom facilities on a documented cultural and burial site in Fremont. 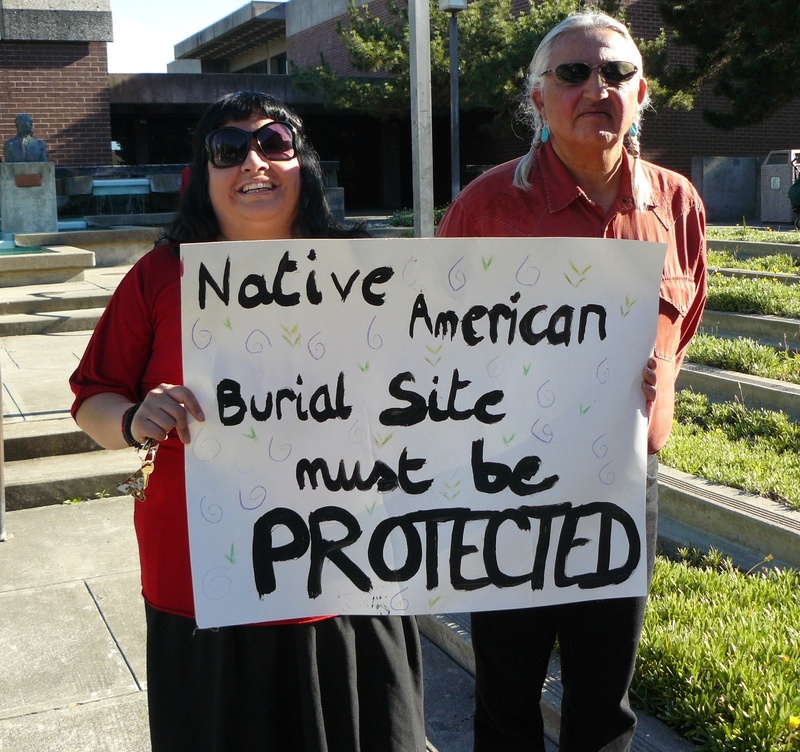 Construction of the parking lot would require extensive grading to level the land and is likely to unearth ancestral burials and sacred objects. We are hoping that you all can come and celebrate our 2nd reunion at Sogorea Te on Sunday, April 14th. 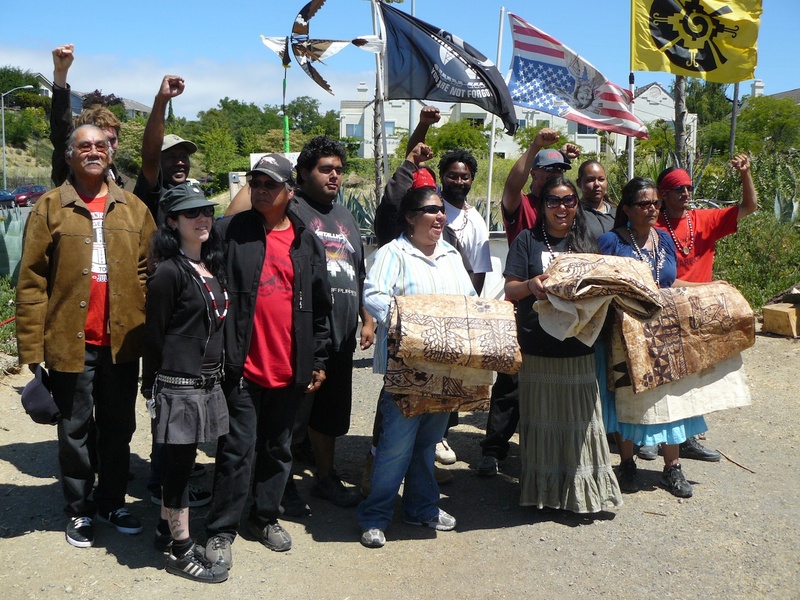 This is the date, two years ago, when we decided to take a stand, started the sacred fire and occupied the land for 109 days for the preservation and protection of the ancestors. While we were protecting the ancestors, they did the same for us and we were able to transform ourselves and dream a community into existence. Meet 1:00pm at Sogorea Te. This is a potluck. Please bring your own plates, cups, utensils and food to share. 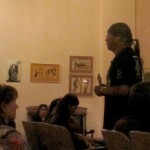 We would like to talk with one another, catch up and remember the fallen warriors. Bring your clappers and hand drums, laughter and stories… See you all soon. 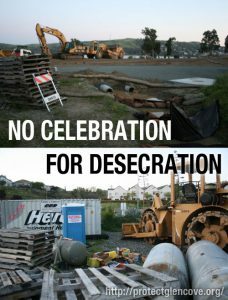 All signage should say No Celebration for Desecration, no other messages please. 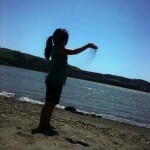 Mexica Dancers will be with us, but we are also looking for others that would like to offer prayer/songs or spoken word. Please bring your own eating utensils, cups, bowls and water bottles and food to share. Please help us in packing out everything we pack in. We are looking for monetary donations. Please support us in assisting those traveling long distances by making a donation online or in cash on the day of. Meet at 10am. Look for security to direct you where we will be gathering. We look forward to seeing many of our relatives and friends. Hope to see you there. 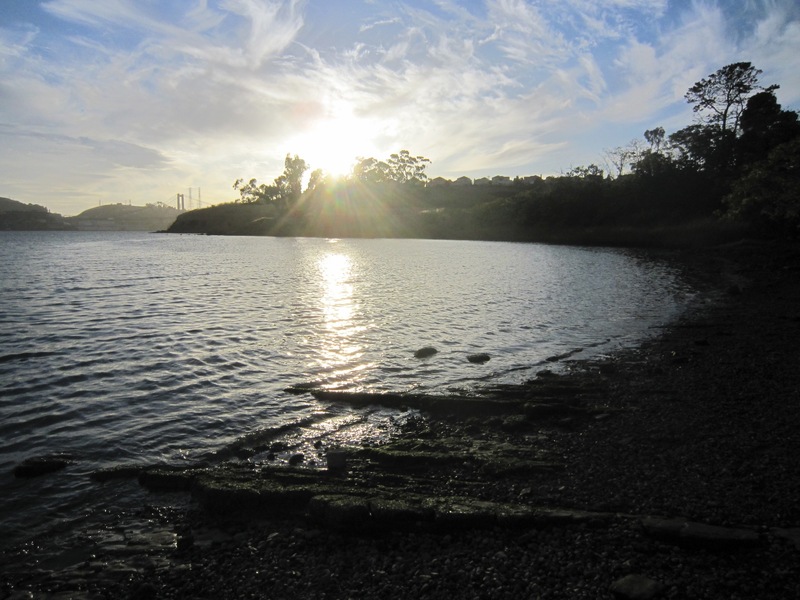 I want to begin by thanking each one of you for your support in protecting and preserving Sogorea Te (Glen Cove), a sacred site that has been in what is now Vallejo, CA for over 3500 years. 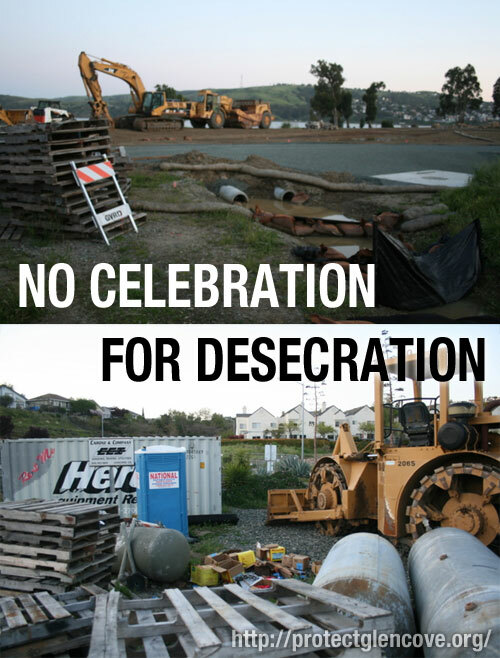 During our occupation of the land from April through July of last year, many of you were instrumental in putting aside your lives, giving of yourselves unselfishly, and participating in creating a living community. 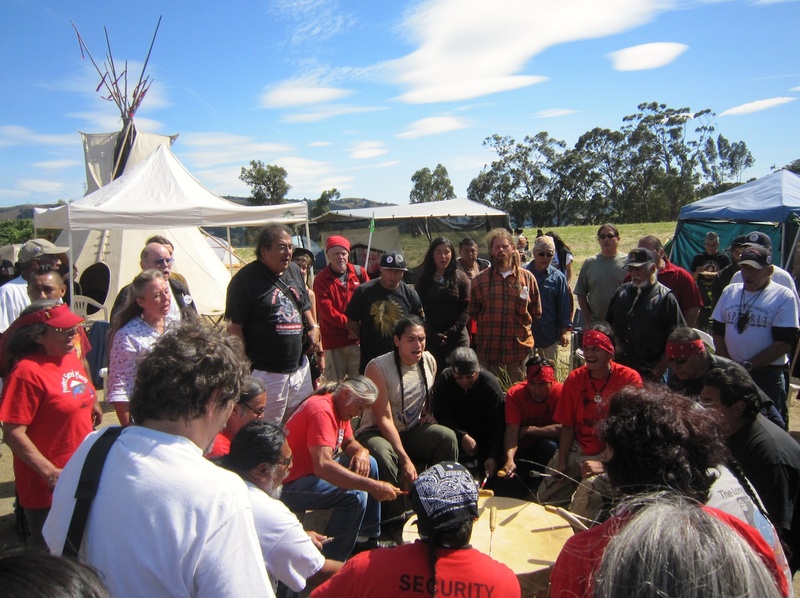 This community allowed us all to not only protect a sacred site, but also to see what is possible for humans when they come together and rely on one another, centered around a basis of spirituality and belief in one another. 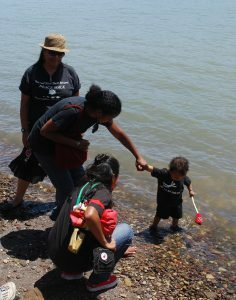 Each time someone walked onto that land and paid respects to the fire, it strengthened the community as a whole. The miracle was not in just protecting the site, but in protecting each other and allowing the space to include almost anyone who came with a good heart and good intentions. 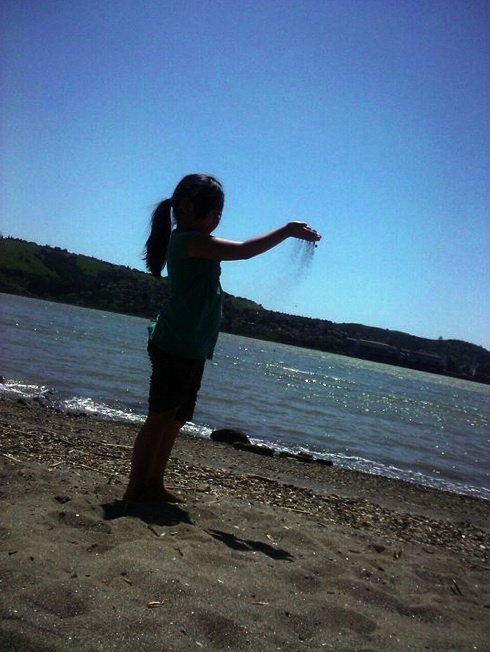 Over the months that we lived together, we endured weather hardships, boredom, laughter, tears, celebrations, and disappointments. We created bonds that will stay with us forever; sometimes with people we would have never imagined being in our lives before Sogorea Te. 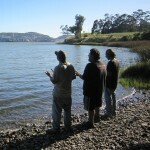 Join a two-week interfaith peace walk from the Diablo Canyon nuclear power plant near San Luis Obispo to the Bay Area. With the tragedy of Fukushima in our hearts, we will walk 15-18 miles a day looking into the safety of land and people along our route, the still-present danger of nuclear weapons, the poisonous nuclear fuel cycle and how to end the nuclear nightmare in California and worldwide. 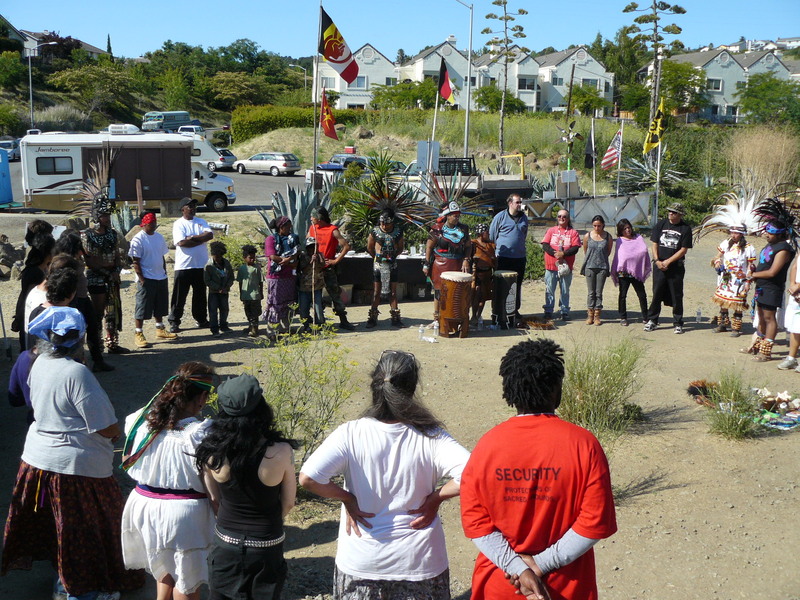 The Diablo Canyon plant defiled a site sacred to the Chumash people, and native lands still bear the brunt of toxic mining and waste disposal that mark the nuclear industry. Accordingly, the walk ends at an indigenous sacred site of true power, consecrated by years of struggle to protect it from development. We expect participation of Native elders and activists, Buddhist monks, Japanese people affected by Fukushima, and citizens who have worked for decades to expose nuclear danger and find alternatives to nuclear power. We will learn from each other and from communities along the way. Everyone is welcome to join for an hour, a day or a week. No alcohol, drugs, or weapons. We need help with lodging, food, organizing local community events, modest expenses, media/communications, and shuttle-transport. 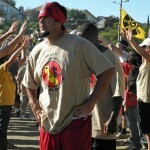 encampment at Sogorea Te will be held on Saturday, July 30th, starting at noon. During the ceremony, long-term participants and warriors will be honored and the sacred fire that has been continuously tended for over 100 days and nights will be allowed to burn out. Bring chairs to sit in and food to share. We’ll be asking volunteers to take trash out with them as they leave. 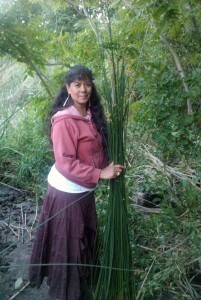 Also, on Sunday the 31st, we will work together to pack everything up and to thoroughly clean and restore the grounds. Extra hands will be very much appreciated. 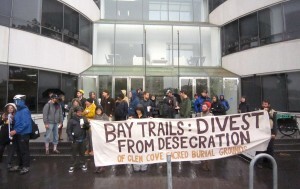 Easement and Settlement Agreement with the Cortina and Yocha Dehe tribes, granting them legal rights to oversee and protect the sacred grounds at Glen Cove. 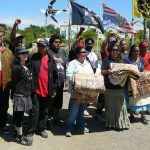 Charlie Wright of the Cortina Band of Wintun Indians and Marshall McKay of Yocha Dehe attended the council meeting, as did approximately 35 people from the prayer vigil at Sogorea Te. 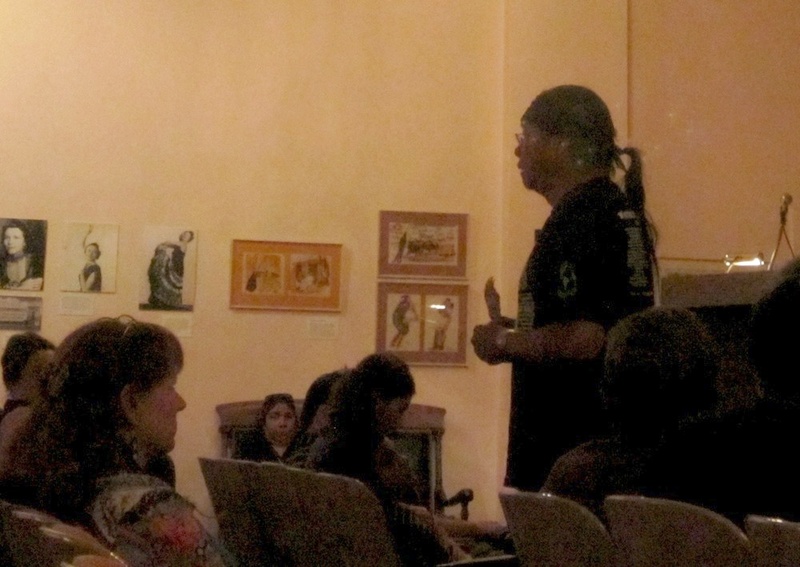 Marshall McKay addressed the Council during the public meeting, asking them to finalize the agreement. 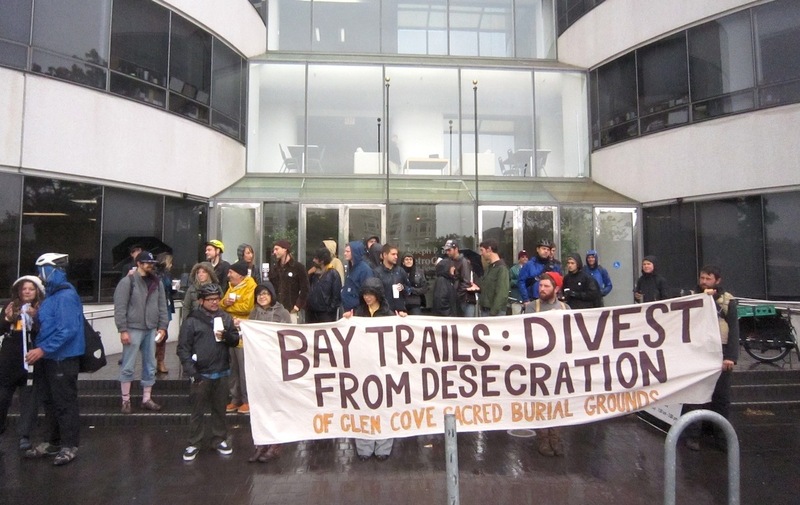 During his speech he kindly addressed the long term resistance to the City and GVRD’s plans at Glen Cove, stating that “the resistance is born from a deep and abiding protective spirit.” A transcript of McKay’s full statement can be found below. be held at Sogorea Te on Saturday, July 30th. Details TBA. 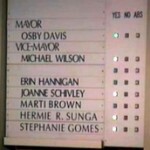 Committee to Protect Glen Cove is pleased to announce a victory in the struggle to protect the sacred grounds of Sogorea Te/Glen Cove. 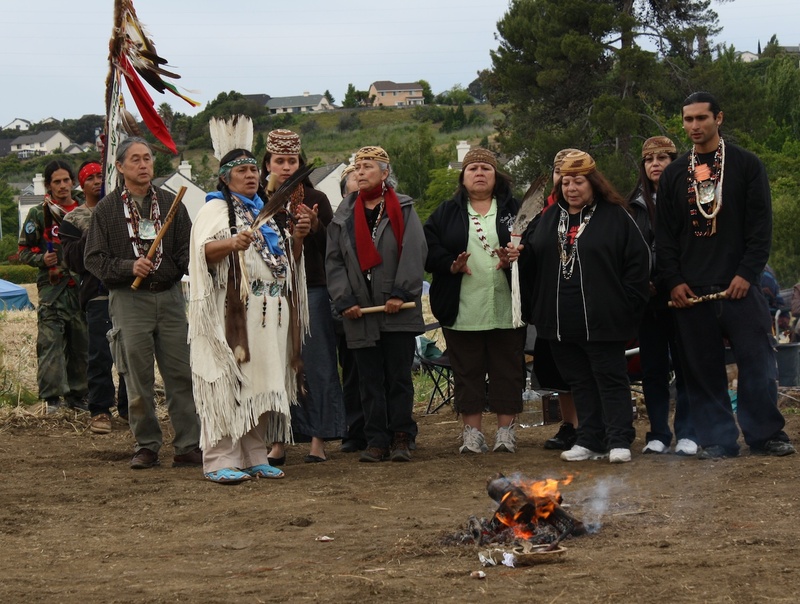 GVRD Headquarters, dozens of committed warriors, elders and supporters have remained in prayer on the land at Sogorea Te, tending the sacred fire and upholding their commitments to seeing the struggle through. As day 100 of the 24-hour prayer vigil approaches, everyone eagerly awaits news regarding the cultural easement being negotiated between the City, GVRD, and the Cortina/Yocha Dehe tribes. 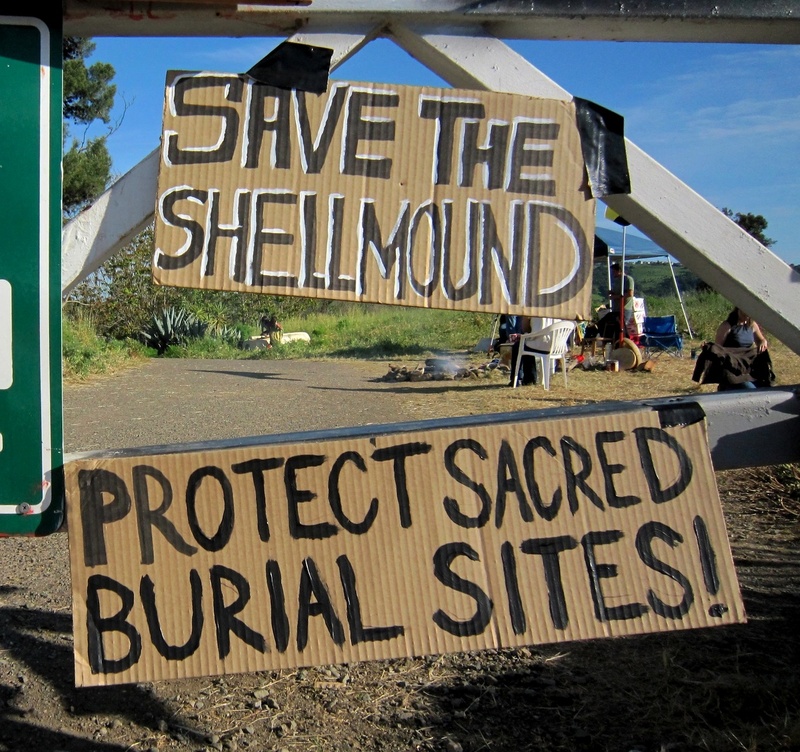 We pray that it will be an honorable agreement that will protect the ancestors by specifically preventing development and bulldozing on all 15 acres of the sacred grounds. 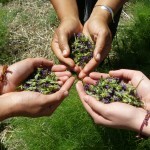 Each day, new visitors arrive at Sogorea Te, bringing prayers, gifts and inspiration, while longer-term participants in the vigil continue to develop relationships with the land, its plant and animal life, and each other. 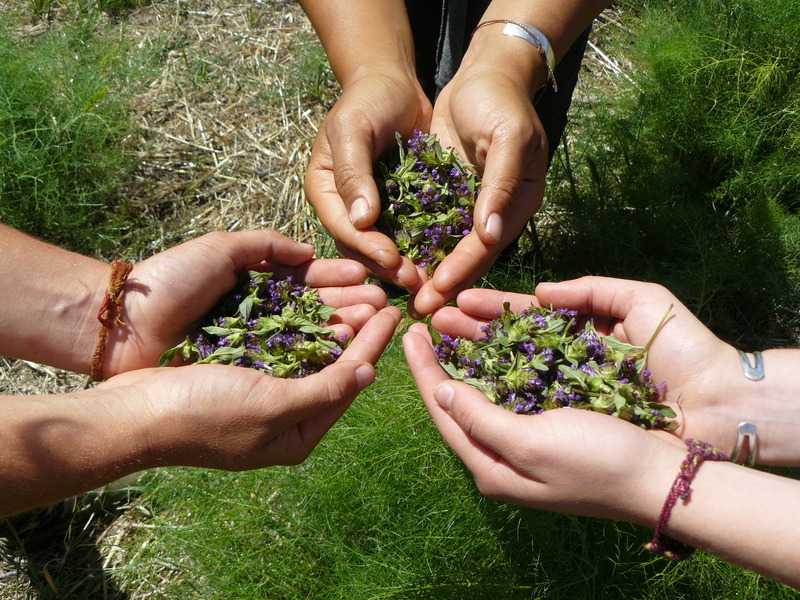 Some have continued to gather wild native plants from the area, such as Amole Lilies and California Mugwort, for use as food and medicine. 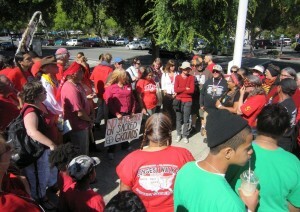 steps of Vallejo City Hall to bring a strong and clear message to City Council, which was holding closed session meeting regarding the future of the sacred burial ground known as Sogorea Te (Glen Cove). Demonstrators arrived an hour before the scheduled meeting, gathering together around the drum to sing before entering the council chambers. 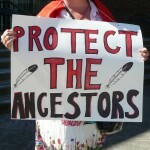 Colorful signs carried messages such as “No bulldozing on sacred ground” and “Protect all 15 acres”, referring to the cultural easement that is currently being negotiated by the city, GVRD, and two federally recognized Patwin tribes that the city has chosen to acknowledge as stakeholders. 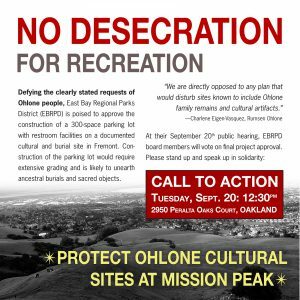 The details of this draft cultural easement have not been revealed to the public or to the Ohlone and Miwok-led Committee to Protect Glen Cove. Speakers throughout the evening encouraged the city to ratify the easement, with the qualification that in order to meaningfully protect the burial grounds, any agreement must encompass all 15 acres and prohibit bulldozing and development. 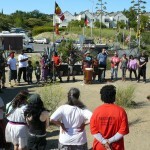 re-occupation of Sogorea Te continues with spirited determination. 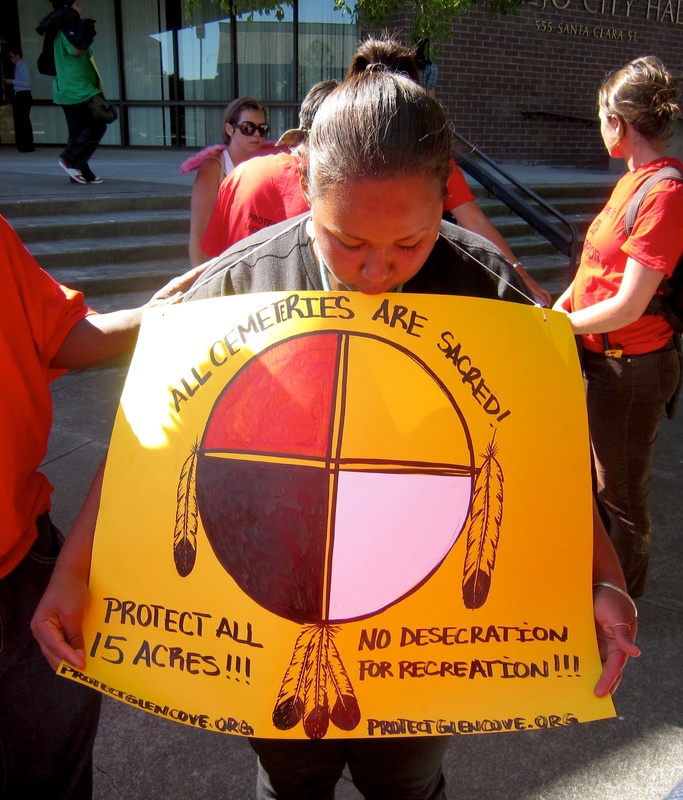 Every long, sweltering Summer day, dozens of Native people and their supporters re-affirm a commitment to honoring the ancestors and being active caretakers of the land. Over the past week, hundreds of visitors of all ages and walks of life have continued to visit the sacred grounds of Glen Cove, bringing gifts, sharing kind words, and offering their prayers to the fire. While prayer remains the center of all our efforts, work is always continuing in the realms of public outreach and legal strategy. This is a critical time in the struggle to protect Glen Cove, and we are asking our central California supporters to attend the Vallejo City Council meeting taking place this Tuesday, the 12th. 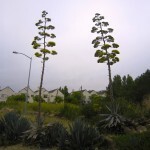 The Committee to Protect Glen Cove would like to lend our support to the cultural easement proposal set forth by the Cortina and Yocha Dehe tribes. 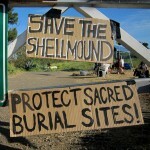 After twelve years of dedicated struggle towards preventing the desecration of this 15-acres of sacred land, the local Native peoples involved applaud the decision by these two tribes to step up and join in its preservation. 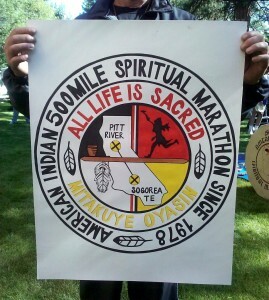 ranging in age from 4 to 84 years arrived at Sogorea Te, as the final destination of the 33rd annual 500 Mile American Indian Spiritual Marathon. The marathon had begun with ceremonies on June 19th (Sunday) in Pit River territory. 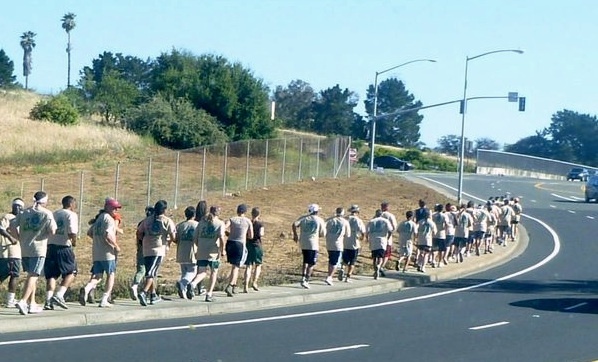 On Thursday morning, the runners departed from Clear Lake, bound for Vallejo, CA. tending of the ceremonial fire at Sogorea Te. 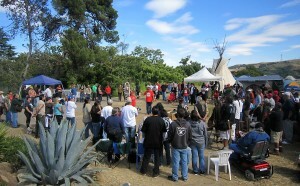 While meetings and strategy discussions are held in the background, dozens of committed native and non-native people remain present on the land in prayer. A steady stream of supportive visitors continues to pass through daily with donations and words of encouragement. Some stay longer, to share songs and stories, teach skills, help out with chores, cook a meal for the group, or offer prayers. 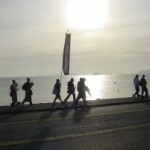 many nations, races and creeds attended a Spiritual Gathering in the bright afternoon sun. 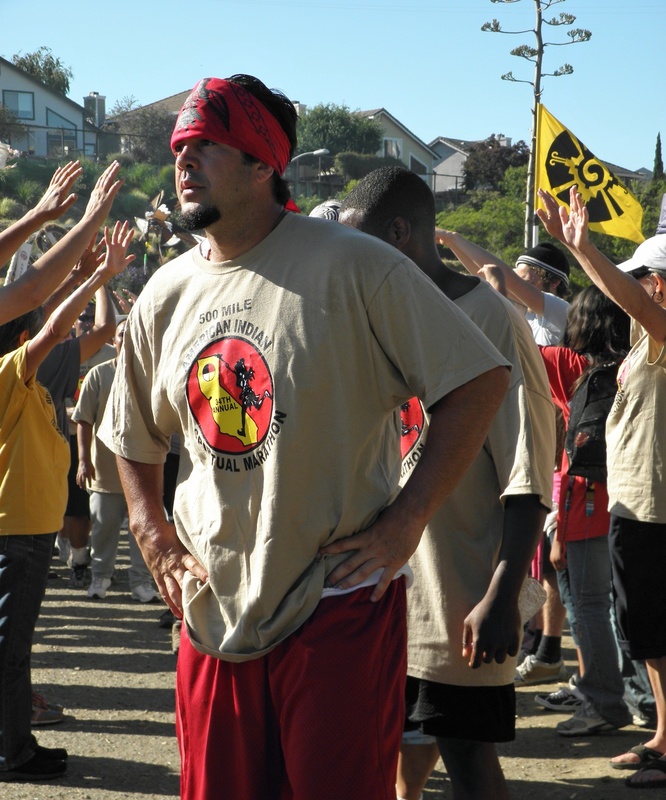 Representatives of many California tribes were present, including the Cachil Dehe/Colusa Band of Wintu, Elem Pomo, Grindstone Wintu/Wailaki, Northern Chumash, Chemehuevi, Tuolumne Me-wuk, Pit River, Maidu, Mono, Karkin Ohlone and Rumsen Ohlone. 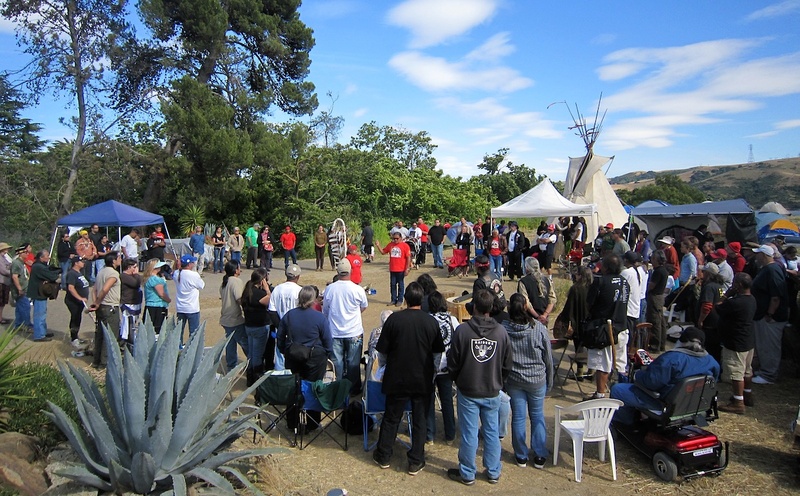 Food and supply donations flooded the camp kitchen today, including trays of hot Indian food from a local restaurant, large boxes of produce from the South Central Farmers and six boxes of supplies brought by the Santa Barbara chapter of the American Indian Movement. Spirits were high, and speakers throughout the day affirmed an unwavering commitment to protecting sacred places and carrying forward traditional ways of life. 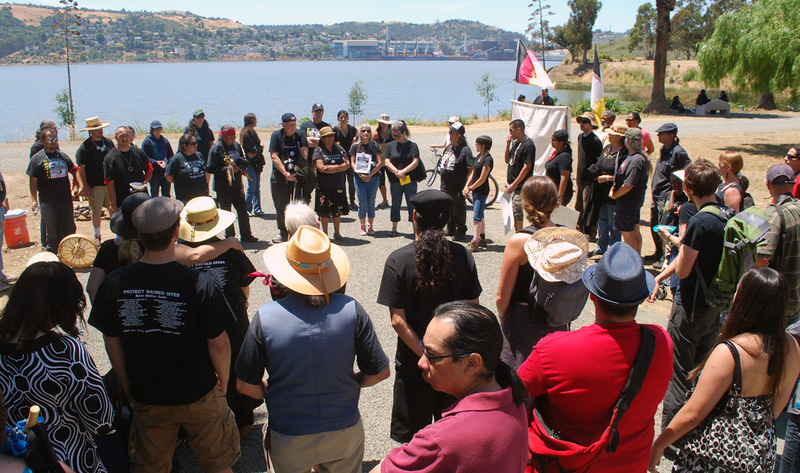 Corrina Gould (Karkin/Chochenyo Ohlone) addressed the group, expressing gratefulness for all the sacrifices and contributions that have made these 59 days of continuous prayer and resistance possible. 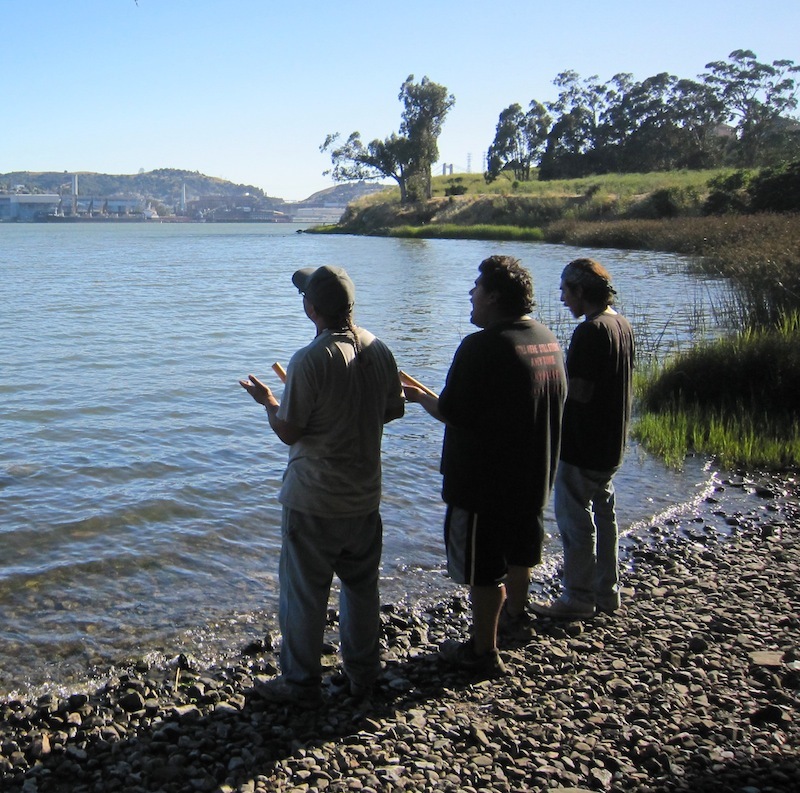 the Winnemem Wintu tribe held a ceremony for the Salmon at Sogorea Te (Glen Cove), and blessed the sacred grounds that Native people and their supporters have been standing upon in prayer for 52 days and nights. 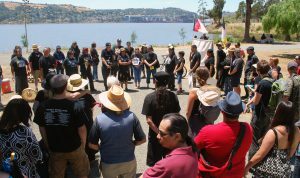 Over 100 people participated in the ceremony, held on a bluff overlooking the waters of the Carquinez Strait. The homeland of the Winnemem Wintu is centered around the McCloud River in Northern California, which for thousands of years was one of the most fertile salmon spawning rivers in the West. 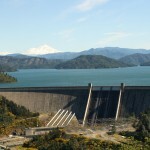 In the 1940s, construction of the Shasta Dam resulted in the flooding of Winnemem villages and sacred places, and effectively wiped out the McCloud Salmon by blocking their upriver passage. 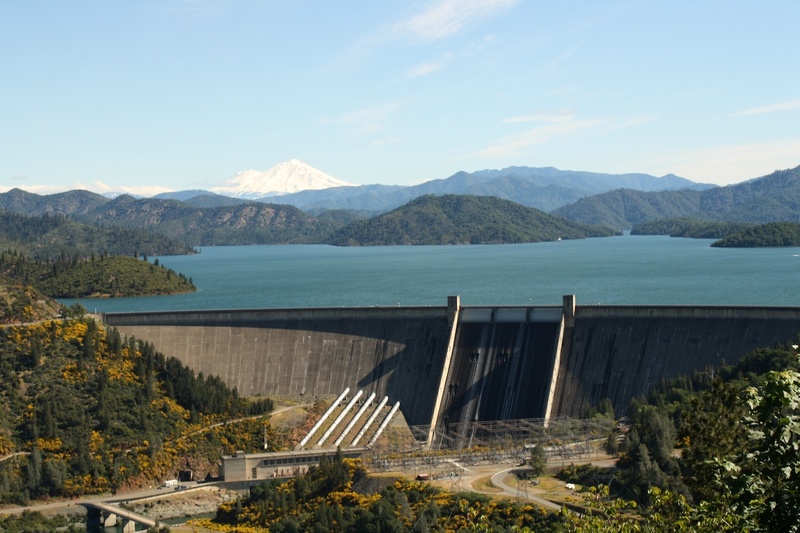 The Winnemem are currently battling a proposal to further raise the Shasta Dam, and are working passionately to restore their ancestral relationship with Nur, the Salmon. 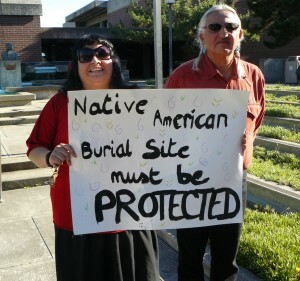 Vallejo, California – In the 56th day of their Spiritual Vigil, Native Americans working to stop destruction and desecration of the sacred burial ground at Glen Cove in Vallejo welcomed the decision by the San Francisco Bay Trail Project of the Association of Bay Area Governments (ABAG) to suspend its $200,000 grant to the Greater Vallejo Recreation District. 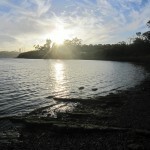 The statement from ABAG and their Bay Trail Project states: “The issue of concern is that the proposed half mile Bay Trail segment on the Glen Cove property in Vallejo is part of a larger GVRD development that affects sensitive Native American burial sites.” ABAG’s statement says that the grant is being suspended until cultural land use issues are resolved.